This parser first searches the web page for one of the entries in the "TableLocator" string set. This allows skipping forward to the table to be scraped. 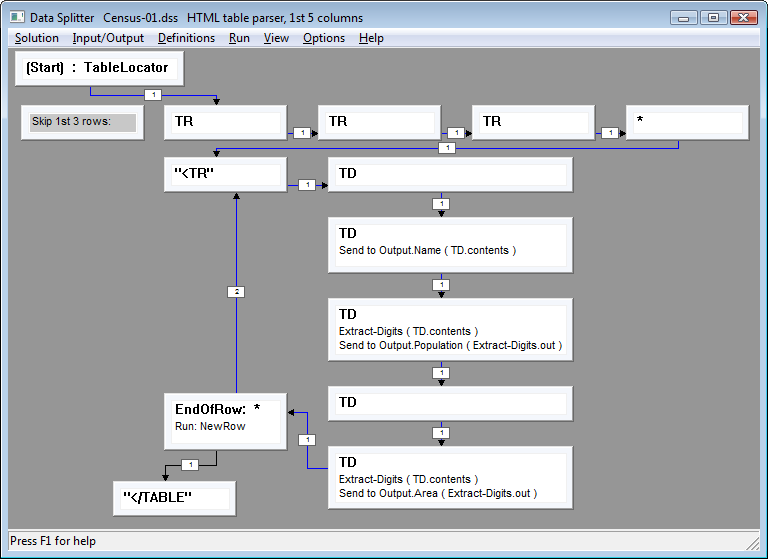 The parser then skips three table rows (the 3 TR nodes with no actions), and starts collecting data at the fourth table row (TR). the contents of the fifth column are sent to the output table's Area field. The numeric fields are "cleaned up" with the Extract-Digits node group. Extract-Digits just removes commas for now, so the fields can be loaded into numeric database fields. Extract-Digits can be extended to remove other non-numeric characters. This parser is included as part of the DS Census table scraper sample. It can be adapted to parse HTML tables with any number of columns.